After almost twenty-five years plus in the construction industry, Perry Villarreal decided it was time to strike out on his own and decided to form Valcon General, LLC. With Perry’s vast work experience which included working for various General Contractors, Perry knew exactly how he wanted to shape his venture, all the while keeping in mind that the client was always going to be his first priority. One definite thing that Perry wanted for his new company that it be a family affair, so with the help of his sons Cody and Jordan, Valcon General became a true family affair. Now armed with over forty years of contracting experience, the Villarreal family knew exactly what kind of contracting company they wanted to build. Their vision was to build a contracting company that provided their clients with exceptional craftsmanship, always using top quality materials, only sub-contractors who not only are experienced and professional, but are also licensed and insured, and with integrity as it’s number one goal, making sure that clients interest are always put first. On each construction project Valcon General works on, their number one goal is to surpass each and every client’s expectations. The Villarreal Family understands that with almost every home remodeling project, the client is planning on enjoying their new kitchen, bathroom, additional room, or complete remodel for years to come. Therefore, one thing that they have always delivered to their clients is the promise that a corner will never be cut and sub-standard material is never used. In every project Valcon General takes on, it considers its clients as partners in the project with the goal of taking the client’s visions of what their project should look like and turning that into a reality. They fully understood that being a family business meant that they look at their clients as family, not just a profit center. 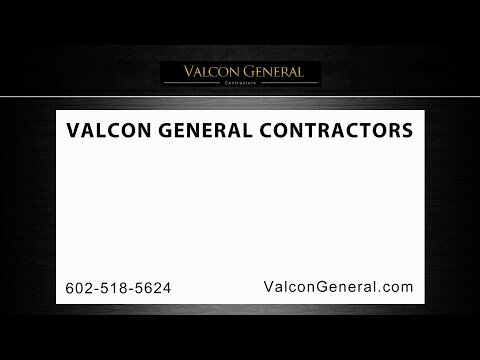 They also knew that any potential employees that would work for them would have to have the experience and professionalism needed to make sure Valcon General, LLC would be one of the high-rated AZ General Contractors across the entire Valley. The Villarreal Family designed Valcon General to earn their customers trust by providing them with only top-quality Arizona home remodeling services, expertise and the professionalism that they felt their customers deserve when working with a General Contractor. In fact, most of Valcon General’s continued success year after year comes directly from loyal and satisfied clients who in turn recommend Valcon General to their friends and family for all their contracting projects. We fully understand that clients face quite a decision when it comes to choosing a General Contractor, that’s why All Vee’s will go that extra mile to ensure the client is pleased with the final outcome of project and wouldn’t hesitate at all to use us for all future contracting projects. Since 2008, Valcon General has made a promise to its clients and never has that promise ever been broken that says a client’s complete satisfaction comes above all else. The Villarreal Family invites you to contact us to experience firsthand the difference in working with a professional and experienced Phoenix General Contractor and one that will work closely with you to make sure that what you envisioned the project to be is the same one when completely finished. Valcon General is fully licensed, bonded, and insured. We look forward to working with you on your next new kitchen contracting project.